Kbal Spean is described as “a spectacularly carved riverbed, set deep in the jungle to the northeast of Angkor”. The river over which the bridge head exists is also known as Phnom Kbal Spean, a tributary of the Siem Reap River that rises in the Kulein mountains north of Banteay Srei. The river bed cuts through sandstone formations, and the many architectural sculptures of Hindu mythology have been carved within the sandstone. The archaeological site occurs in a stretch of the river starting from 150 metres (490 ft) upstream north of the bridge head to the falls downstream. The river, being sanctified by flowing over the religious sculptures, flows downstream, bifurcating into the Siem Reap River and Puok River, which eventually flows into the Tonlé Sap Lake after passing through the plains and the Angkor temple complex. Sequentially, while walking along a path which skirts the eroded channel of the river-formed natural stone bridge, one can see a pair of Vishnu sculptures with Lakshmi seated at his feet in a reclining pose. Upstream of the bridge, there is a sculpture of Shiva and Uma mounted on the bull. Approximately 30 metres (98 ft) downstream of the bridge, there are additional Vishnu sculptures. Further downstream up to the water fall and till the water pool are the Sahasra lingas in Sanskrit language with English equivalent name of “River of a Thousand Lingas”. The sculpted lingams in the coarse sandstone river bed outcrops are seen from about 6 metres (20 ft) downstream of the bridge. According to the journalist Teppo Tukki of Phnom Penh Post who visited the site in 1995, the lingams, some of which date back to the 9th century, are about 25 centimetres (9.8 in) square and 10 centimetres (3.9 in) deep and lined in a perfect grid pattern. The river runs over them, covering them with 5 centimetres (2.0 in) of pristine water. 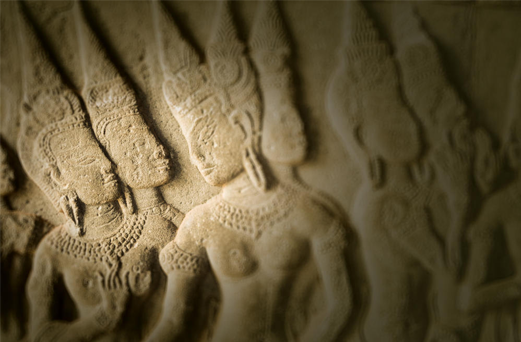 The holy objects are designed to create a “power path for the Khmer Kings”. After the carvings, the river falls by 15 centimetres (5.9 in) to a clear water pool. As it flows over the holy lingams, the river attains a sanctified status and passes through the temples that are downstream. The visible lingams are in a rectangular enclosure with a channel flowing out, which is interpreted to represent the yoni as the “female principle”. Beyond these lingams, the river stretch of about 40–50 metres (130–160 ft) includes a small rocky island and ends over a fall into a pool. In this stretch of the river, there are bas reliefs on the rock faces. It has been inferred that one of the bas reliefs in this stretch, the central figure, unrecognizably damaged, could be that of Shiva as an ascetic, similar to the bas relief seen in Angkor Wat temple. The meaning of the crocodile carving seen here has not been ascertained. Near to this location, a boulder has been carved as a frog. The pond, in a rectangular shape, filled with water at all times, has many “Reclining Vishnu” carvings on the walls, and here again, a pair of crocodiles are carved but with their tail held by women. The small island formed in this stretch of the river has carvings of Shiva and Uma mounted on a bull. Though the sculptures have been vandalized and damaged, the carved idols still retain their original grandeur. Under the supervision of archaeologists, the graduates of Artisans d’Angkor have been able to reproduce some portions of Kbal Spean’s missing bas-relief carvings.